This painted plaster head is of the French-born painter, etcher and sculptor Alphonse Legros (1837-1911) and is by the French sculptor Aimé-Jules Dalou. 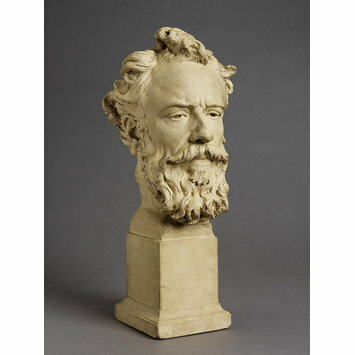 The two trained together as sculptors in Paris but Legros then came to London. Dalou later fled to London as a political exile and remained 1871-9, and on Legros' recommendation was given a teaching post at the National Art Training School (later the Royal College of Art). This head is all that remains of a full-length figure that Dalou himself destroyed. It is recorded (by Dreyfous in his biography of Dalou) that the original sculpture showed Legros with a palette in one hand and brush in the other, his head inclined slightly back considering the work in front of him. When this was destroyed, the head was retrieved by Edouard Lantéri. Dalou (1838-1902) was the son of a glove maker and initially trained in drawing at the Petit École in Paris. In 1854 he entered the École des Beaux-Arts, where he trained for four years. He was known for his left-wing political sympathies and was involved in the establishment of the Paris Commune in 1871. After its overthrow he was forced into exile in London, where he lived from 1871 until his return to Paris in 1879. In London he frequently exhibited at the Royal Academy and he was given a teaching appointment at the National Art Training School in South Kensington (later the Royal College of Art), where he had a profound effect on the development of British sculpture. Legros (1837-1911) worked as a decorative painter before studying at the École des Beaux Arts in Paris. He was impressed by early Netherlandish art and Holbein, later by Courbet, and from 1859 was associated with Whistler and Fantin-Latour. In 1863 Legros moved to London, where he enjoyed the patronage of Constantine Alexander Ionides, and became Professor of Fine Art at the Slade School of Art, and a British citizen. He was also a prolific etcher, and a medallist. Head of Alphonse Legros, looking straight forward and stopping at the neck. There is an integral square socle. Legros has curly hair and a full beard and moustache. 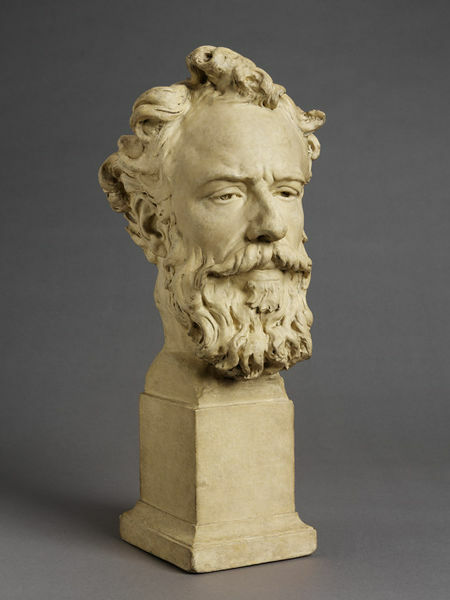 According to the donor this bust was once owned by Edouard Lanteri. It was then in the possession of Mr and Mrs Guy Knowles, and was presented to the National Gallery by Mrs Knowles in 1922, and transferred to the Tate in 1922 and to the V&A in 1969. Between 1973 and 1983 it was at the Bethnal Green Museum, but was not formally accessioned by the V&A until 1993. Corbeau-Parsons, Caroline, ed. Impressionists in London: French Artists in Exile 1870-1904, exh. cat., 2017, pp.150-151.